Students learn about the Butterfly Stages of the Monarch Butterfly Life Cycle. Kindergarten Lesson Plans - LIFE SCIENCE - Organisms - Living and non-living things, compare and contrast, simple groups for living things. First Grade Lesson Plans - LIFE SCIENCE - Organisms - Observe and describe life cycles (how things grow and change). 2nd Grade Lesson Plans - LIFE SCIENCE - Organisms - Recognize and describe life cycles. 3rd Grade Lesson Plans - LIFE SCIENCE - Organisms - Recognize and describe structures of living thing that serve specific purpose in growth, survival and reproduction. Above are the basic science standards addressed in these Teacher Lesson Plans. More science, math and art standards could also be covered in this Unit. Discover the signs and what happens during the final molt of the Monarch Caterpillar when it sheds its skin for the last time and the chrysalis is revealed! Learn how long this third stage takes to happen. Ask the students to recall Stage 1 and 2 of the Monarch Butterfly Life Cycle. Review what the students learned about the Monarch Caterpillar Stage and what was the sign that the next stage is about to happen (the Caterpillar wanders away from the Milkweed to find a place to pupate). "The Life Cycle of Butterflies" by Judy Burris and Wayne Richards - Excellent book with over 400 beautiful photographs! We will be learning about the third stage of the Monarch Butterfly Life Cycle - the Monarch Chrysalis. What does the Monarch Caterpillar do to prepare for the last molt when it changes into the chrysalis? It attaches itself to a plant, branch, or surface by "spinning" a sticky silk "button" to which it attaches its bottom. What happens after the caterpillar is attached? The Caterpillar waits until the button dries and it is safely attached and then gradually releases its legs and "falls" into a J position. What happens when it is time for the shedding of its final skin (molt)? About 18-24 hours after the Caterpillar attaches itself the J gradually straightens and the caterpillar starts to wiggle. The skin on its back splits up the middle and the Chrysalis appears!! How long does it take to shed its skin? About 4-5 minutes and it "does a little dance" at the end to get rid of the skin that it has shed....very interesting! 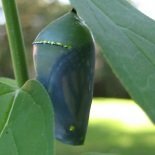 What does the Chrysalis look like? It is shiny green with yellow at first, then it hardens and is a soft green color with a BEAUTIFUL "Golden Necklace" and Gold dots decorating it! Have the students draw a picture of something they learned about the second stage of the Monarch Butterfly Life Cycle. Have them share with the class what their picture represents. Update the time line on the blackboard showing the Monarch Butterfly Life Cycle through the chrysalis stage. Have the students add to their “Virtual Butterfly” by representing the Chrysalis that they learned about today. It takes about a month for an egg to turn into a caterpillar. Teach the four lessons over the month, correlating with this timetable. 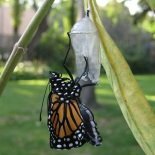 Review Monarch Chrysalis stage and tell them that in next week's lesson they will be learning about Monarch Butterfly emerging from the Chrysalis. Informally assess the the student's progress through the input they share during the lesson and observations of their Art, Math and Virtual Butterfly project. I hope these Free Lesson Plans are helpful in getting your students excited about science, nature, and the beautiful Monarch Butterfly. My new Monarch Life Cycle PowerPoint is the perfect complement to these butterfly lesson plans. Check out Kindergarten, Bulletin Board and Preschool pages for other classroom ideas. Make sure and give the parents of your students a link to this website so they can share the wonderful experience of Raising Butterflies with their kids at home this summer.